To even try listing every, or even most, of the chronic illnesses which you can not tell a person has just by looking at them. 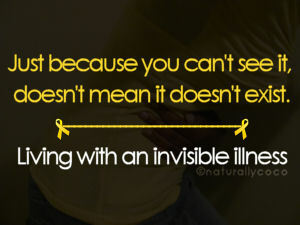 They are called "Invisible Illnesses." For me, it is Cauda Equina Syndrome (CES) AND Diabetes (Type 2). Chronically, for the rest of my life sick? At least partially, if not totally, disabled for the rest of my life? Yet I am. Not only me, but my wife too. She has Diabetes (Type 2), Cardiomyopathy, and Congestive Heart Failure (CHF). So we're both not only victims of these illnesses, but we also have a close loved one suffering from a chronic, invisible illness. So our life contains not just a victim and caregiver spouse of such an illness, but each of us must take care of the other as well. How do we do it? We both take care of our diabetes treatment of insulin, meal planning, and exercise (very limited at this point due to the OTHER illnesses we deal with.) But there are things I cannot do without help, or at all. For those, my wife fills in. The same is true for her - there are things she cannot do or needs help doing. Fortunately, God has blessed us in that for almost everything, one of us can still get the job done and help the other. With mutual support against an identical foe, our diabetes management looks good. My wife's battle with cardiomyopathy and CHF is one we are in retreat with right now. Her cardiologist is changing tactics which we hope will put her back on solid ground, but the battle is the Lord's. My fight with CES is only 4 months old. I suffered at the outset by an incorrect diagnosis. CES patients' best long term outcomes happen when surgical decompression occurs within 24 - 48 hours of onset of symptoms. With the missed diagnosis, an insurance company dragging its heels on an MRI, and a weekend, it took 2 weeks for me to finally get the decompression done. Medical literature states that after the 48 hour window closes, further delay on decompression has little effect on the outcome. My Neurosurgeon says I will most likely always have SEXUAL DYSFUNCTION, WEAK LEGS and INCONTINENCE. So I wonder why God has allowed this, and seek His word and direction. Already I've seen great benefits to me spiritually and in how I relate to people. I'm really seeing how others treat me and am relating it to how I've treated people in the past. God is really growing me, preparing me for a larger role in His kingdom's work here on earth. I've not been a "people" person, now I know that life is about people. Not me, not what I want, but about the people God has placed in my life. 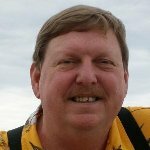 How can I help them? How does God want me to show His love to them through me? Through these trials... I am learning to look through His eyes. Sometimes we should be thankful for just baby steps. Happy trails to both of you. We most definitely are thankful for all that God allows. He has been so good to us through this time of intense growth. Thank you for your comments, Carolyn. We wish both you and Frank the best!